Think of today as the pre-game stretch. We are getting our fingers warmed up for 29 days of writing in response to found objects and posting that writing the same day, as a community. Don’t know what I’m talking about? Read this post to find out more about my annual daily writing project. 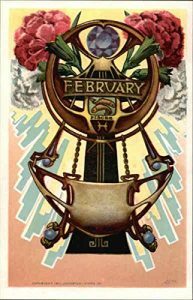 Over a dozen authors gather every February to write in response to a daily prompt. In the past, we have written a month of Pantone poems and a month of responses to sound clips. This year’s theme is FOUND OBJECTS. Several friends have sent in images of objects that we will be using as our daily inspiration. So … how does a person participate? Leave your writing in the blog comments (feel free to post a poem or response in the comments of any project-related post). Be sure to note which day/prompt your poem or prose short goes with so I can post it on the correct day. Send in your writing ANY TIME — early, late. As long as I receive it by February 29, it will be posted along with the object of the day. Perfect attendance is not a requirement of this project. Write and share your work as often as you like, even if it’s only once. The goal is to practice and share, not to polish, and certainly not to aim for perfection. I know you want to see the Week 1 prompts, but be sure to read my pep talk at the bottom of this post. Reminder: I will not be posting any information about the objects at this time. This year, we are emphasizing using all five senses in our imagery, whether we write poems or prose in response to the objects. Thanks for sticking with your coach instead of diving onto writing field with your prompts, everyone. Here are two examples of FOUND OBJECT writing to help you get your head in the game. First up is an old poem of mine, written in response to found objects: a group of children’s winter coats slung over a playground fence. Enjoy these two readings. I’ll see you on Monday! Each hood bows — a line of prayer. On a small farm on the outskirts of a Chinese village, lived a boy named Soso. Soso lived with his grandmother and would often help her gather eggs from the chickens. He helped her sell them on market day. Sometimes, Soso’s grandmother would pay him 50 yuan for helping. Though that might not seem like a lot of money, to Soso it was. He knew his grandmother did not have much money and when she gave him some he always put it in a jar until he saved up enough to buy himself something that he might like to have from the market. He would often take a break from selling eggs and walk around to see what the other villagers were selling. Some sold jars of honey, some sold vegetables, some sold bright pieces of cloth. Then there was the dragon lady. She was one of the oldest, wisest women in the village. She sold dragons. And for every dragon she sold she told a story of wisdom to go with it. Soso loved stopping by her stand. The dragons were too expensive for him but he loved to hear the stories. “Soso, you are a boy of great courage,” she would often tell him. “Someday you will save enough yuan to buy a dragon from me and then I will have a story for you.” Soso could hardly wait for that day so he kept saving his yuan from selling eggs. “I’ll give it to you for 5 yuan,” she said. Soso was so happy that he didn’t notice that the dragon lady had seen what he had done. He went back to his egg stand. “Oh, that is so kind of you,” Grandmother said. “Please, take a dozen of my eggs for your kindness.” That day, Soso’s grandmother went to look at the sand castle but noticed that it was gone from the table. Walking away, she thought about what the dragon lady said about Soso. She thought, “If only I could make our lives easier. I will wait until the weekend to give him his hat,” she said. “Thank you, Soso,” said grandmother. As she opened it, tears streamed down her face. “It’s my castle” she said. Soso said, “No, it’s our castle. Our home is our castle and I wouldn’t want to live anywhere else.” For a moment Soso forgot about the dragon lady’s hat. To Soso, that sounded familiar but he couldn’t remember why. He opened it. “It’s my hat! My dragon hat!” he said. This week’s host is Catherine at Reading to the Core. After nearly eight years blogging as Author Amok, I am moving to my new website! As of February 1, I will be blogging and participating in Poetry Friday right here at www.laurashovan.com. There are a few housekeeping items to share before I close up shop at the old digs. This year’s theme is FOUND OBJECTS. I invite you to join this community project. The focus is on writing every day (or as often as you can) and sharing the results with our fellow poets and authors — an opportunity to focus on drafting and to turn off our inner-editors for one month. We always have a great time with this project and there are prizes for contributors. This year, we are focusing on writing about FOUND OBJECTS using multi-sensory imagery. You’ll find more information about the project at this post. And here is a sneak preview of our first writing prompt, contributed by Robyn Hood Black. If you’d like to contribute a poem, please leave it in the comments of this post. Be sure to specify that this is your DAY 1 found object poem. Second, an update on my book launch. THE LAST FIFTH GRADE OF EMERSON ELEMENTARY will be published on April 12. I’m excited to have a book birthday during National Poetry Month. The Poetry Friday community has been so supportive of this project. In the weeks leading up to NPM, I’ll be introducing the Emerson E.S. fifth graders at the new blog. I came across this poem today, which was cut from the novel. Newt Mathews is an amphibian-loving, rule-following student who shares in his poems how Asperger’s Syndrome affects his writing. Mr. White is his aide. You can spot Abigail Halpin’s wonderful illustration of Newt at the bottom right. He’s dressed in his favorite frog T-shirt. The Tower, symbolic or real, is the theme of this speculative fiction anthology. Read more about it at Goodreads. Another update: I am giving away two copies of the spec fiction anthology HIDES THE DARK TOWER at my author Facebook page. I was honored when editors Kelly Harmon and Vonnie Winslow Crist asked me to write a poem to open the anthology. Stop by to enter into the drawing. Thank you all! Blogging at Author Amok has been an adventure. It’s been wonderful to have so many traveling companions. Since my middle grade novel sold in 2014, I’ve gotten to know many of my fellow debut authors. Within that group is a small cadre of poets who also write fiction for children. Some of us have had long careers publishing in literary journals and teaching creative writing before we made the cross-over to a big-press contract with a middle grade or YA novel. One of these poets is Ruth Lehrer. 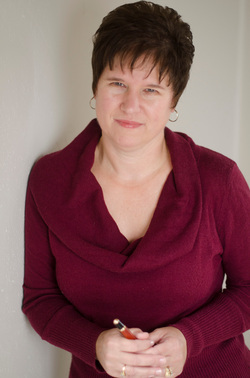 Ruth’s fiction and poetry is widely published in the world of small presses. Her young adult novel, BEING FISHKILL, debuts from Candlewick in 2017. You can read about it here. Today, I’d like to focus on Ruth’s poetry. 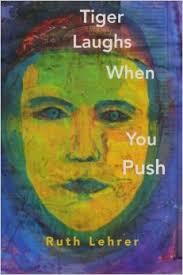 She’s celebrating the new year with the publication of her first chapbook, TIGER LAUGHS WHEN YOU PUSH, from Headmistress Press. a garden in a westchester suburb. qie zi — my one chinese word. I asked Ruth to give us a little bit of background on this poem. Find out more about TIGER LAUGHS WHEN YOU PUSH at Goodreads. Early this morning, a bright white flashed at the windows and thunder shook the house. I knew this blizzard would be a significant one for me. It is the first storm where keeping everyone indoors does not include my son. He is six hours away, a freshman in college. “An Absolute Vista” is an older poem of mine about a winter storm (judging from my son’s age in the poem, it must have been 2002 or 2003). A few weeks ago, I was visiting Marriott’s Ridge High School, working with students in my role as HoCoPoLitSo’s Writer-in-Residence. The high schoolers had been reading a packet of poems, ones I have written and a few that I’ve edited. I asked them which poems they wanted to discuss. A young man at a back table raised his hand and asked for this poem. There were two English classes attending the session, and we had an in-depth discussion about the characters in this poem: who is acting, who is observing and reporting, and what does this say about their relationships? We talked about elements in the poem that create a sense of tension between the mother/speaker, the son, and the father. There’s a strange detachment that happens when I enter into a conversation about one of my own poems, especially an older one. That detachment helps me. I’m no longer the expert on the poem. Along with the students, I am a reader. Their insights often help me recall details in the writing process that I’d forgotten, or to see elements of the poem I wasn’t fully aware of. A little history on this poem: It was written in response to William Stafford’s “With Kit, Age 7, At the Beach,” and takes its title from a line in that poem. What do you notice when you read the poems side by side? to walk and meet his father. White erased everything – fences, sandbox. Ground was something to imagine. to puncture the icy crust with his boots. crawling away from the house. No one near but the wind, racing. and lifted him off that shifting surface. each step sinking to the good, solid ground. Hey, everyone. I’m migrating my occasional series, “Laura’s Bookshelf,” from Author Amok to the new digs. If you’ve missed a past episode, you’ll find a full list of what’s been on my bookshelf at the end of this post. One of the best parts about being a debut novelist has been connecting with other middle grade and YA authors in the class of 2016. Over the holiday break, I read THE DISTANCE FROM A TO Z by Natalie Blitt. This French (and baseball) infused summer romance had me ignoring the cold, dreary weather. Instead, I dreamed about walking on the sunny, cobbled streets of old Montreal. Preferably with a cute boyfriend by my side. (Hey — I’m allowed. My cute HS boyfriend is now my cute husband of nearly 25 years). Abby is spending the summer on a college campus, where she is taking an intensive French course, designed to bring her from awkward to fluent in the language of love. Being a Francophile is how Abby has defined and identified herself, a way of separating herself from her family’s overbearing obsession with baseball. There’s only one other high schooler in her class, and he’s super cute, but those baseball t-shirts he’s always wearing are kind of worrying to Abby. What follows is an adorable “will they or won’t they get together” story. With a lot of coffee. And one of my favorite BFF’s ever, Abby’s summer roommate, Alice. 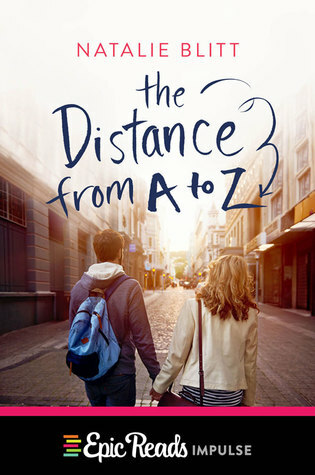 THE DISTANCE FROM A TO Z is appropriate for older middle school and up. (There is some very mild underage drinking). Teens who enjoy fun romance novels. Readers who share Abby’s need to form an identity for herself. What it’s like to be immersed in a foreign language program. The importance of honesty in a new romance. Those who are new to the Bookshelf, I always pair a poem with the books I feature. And I found THE PERFECT poem for Abby and Zeke. If you read May Swenson’s “Analysis of Baseball” as a metaphor for relationships, the push and pull are exactly what’s happening in this story of Summer Lovin’. and the mitt. the time. air, or thuds in disgrace. late, don’t and the fans. (thwack) to mitt, and for fun. This “Save Our School” button is actually a promotional postcard for my book. Can you imagine Ms. Hill’s class wearing buttons like these to protest the closing of Emerson Elementary? My friend, poet and educator J.C. Elkin. was asking about my debut children’s novel, THE LAST FIFTH GRADE OF EMERSON ELEMENTARY. This, fellow writers, is a question that strikes fear into the hearts of many novelists. As soon as these words fall from someone’s lips (especially if that someone is an editor, agent, or book blogger), you have exactly 2-3 sentences to explain the book that you have spent the last X amount of years working on. In a nutshell. I’d been working my 2-3 sentences, what’s known as “the elevator pitch.” I was prepared. Here comes the serendipity part. What? Schools — both public and parochial — being shut down is a huge issue in my home state of Maryland right now. [You can read about parents protesting the closing of North Carroll HS at the WBAL website.] Communities are, understandably, invested in their schools. When a Board of Education slates a school for closing, it has a negative impact on the students, families, and the surrounding community. But that’s happening now. Jane was talking about many years ago, when she was in high school. I’ll let Jane, who is a past contributor to my Author Amok blog, tell us the details. In the winter of 1974, my school nearly closed and I found myself fundraising for a place I thought I hated. It was freshman year at a parochial school I’ll call Saint A’s, which my mother forced me to attend after student-teaching a year at the public school my brothers attended. She transferred me in July when it was too late to say goodbye to my junior high friends, the best friends I’d ever had at the school where I’d been happiest. Saint A’s was wrong for me on every level. It drew scholars from a thirty-five mile radius in a town I’d never been to. I was a so-so student, gifted with words and inept with numbers. Saint A’s had the worst music program in the state, officially, based on a state-wide competition. I was a talented singer, and the public school music program was the best in the state. Then again, they also had a slew of social problems my mother had seen first-hand: drugs, violence, bomb threats . . . She had seen girls cat-fighting over the fathers of their babies and seen my eldest brother beaten to a bloody pulp by a gang in the woods where he ran cross-country. She saw only a den of iniquity and a naïve girl she needed to shelter. Academics had little to do with her decision, though my second brother, the smart one in the family, was allowed to transfer with me. Of course, Saint A’s had problems, too. Over its thirteen year history, it had developed a reputation for academic excellence amid mismanagement. Students wore any of four different uniforms dating back to the school’s inception, and the place was drowning in debt because the nuns who founded the school were now outnumbered by lay teachers. The football team, however, after two years without a win, had just won the state championship, and the once glorious debate team was rising from the ashes of dormancy. Nevertheless, when the administrators called a meeting to inform us of the financial crisis, they had already made up their minds to close. The meeting was held in the gym on a school night, standing-room-only amid a crescendo of nervous chatter. The new principal, a stout nun, sat on the stage as rigid as a deposed monarch on a folding throne. Her diminutive administrator, an affable little priest who’d bungled the budget from day-one, was hunched by her side, the Board lined up at a distance. After a brief prayer, they cut to the chase. Unfortunately and unavoidably, that year’s graduating class would be the last. Everyone froze in stunned silence. Then a look of dismay washed over their faces, infecting me. After only five months, I suddenly didn’t want to leave. I should have been ecstatic; I was finally going to get what I wanted. But leaving Saint A’s would mean leaving new friends, the speech team, the band’s baton squad, honors classes where I was excelling, and even the tiny chorus where I discovered I liked small ensembles better than large ones. So there we were, four hundred students trying to wrap our heads around this new reality, and you could hear the hum of the lights. Instant silence. Why not? A car wash, a raffle, a spaghetti dinner? The usual ideas were tossed around and rejected like underinflated volleyballs. Then some rich kid suggested, “What if each family gave a dollar a day?” A mighty groan went up from the blue collar sector. Three hundred sixty-five dollars was about a year’s tuition in 1974. Today it is over twelve thousand. The segue from idea to action was immediate. Desks were dragged in, and within minutes the gymnasium was divided into communities with committees formed and names, phone numbers and addresses recorded. The accountant targeted a figure, and a Saturday was set for the student body to go door-to-door with coffee cans. Our sales pitch: no donation too small but a dollar a day would be great. A plywood thermometer was posted on the lawn, and we reached our immediate goal by spring. Only one student received a pledge of $365 from a stranger, but it was a real eye-opener to see who gave and who didn’t. My 7th grade English teacher, who lived in a beautiful seaside cottage, didn’t believe in supporting private education –not even a dollar’s worth –but a shabbily dressed maid from the nearby resort emptied her pockets for me. Smaller fundraisers followed, but our grassroots organization was the magic bandage. Three years later, with the school’s music program officially defunct, I won the state championship for debate and was accepted to a prestigious liberal arts college. I often ponder how my life would have been different if Saint A’s had closed. I would have gone on to study music, but I wouldn’t have developed academically. I definitely would not have met my debate partner, who caused me to meet my husband, and that meant I wouldn’t have lived in Europe where I became bilingual and continued to hone my vocal skills, which ultimately led to a career teaching language and music. I went on to sing professionally for thirteen years at, ironically, the country’s largest Catholic church –the Basilica of the National Shrine of the Immaculate Conception in Washington, D.C. There, I sang televised soli, made seven recordings, travel to Rome twice, and even sang for the Pope in a private vespers service. Forty-two years after the 365 Club, twenty-one years of teaching later, thirty-three years of marriage later, two children and two grandchildren later, I can’t complain. J.C. Elkin is an optimist, linguist and singer whose writings draw heavily on spirituality, feminism, and childhood. Her work teaching English as a Second Language inspired her chapbook World Class (Apprentice House, 2014). Other poetry and prose appear in such journals as Kestrel, Kansas City Voices, Delmarva Review, and Angle. Visit Jane’s webpage at the Broadneck Writers Workshop . Hey, Writerly Friends. February is almost here. You know what that means. It’s time for our annual daily writing workout! For the past three years — in order to practice writing and give something back to others during my birthday month — my blog has hosted a big poetry project. 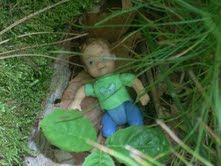 “Doll.” Found in a tree stump at Squam Lake, NH. Since our past projects have focused on visual and auditory prompts, let’s go multi-sensory this year. Our 2015 theme is FOUND OBJECTS. For the next several weeks, please send in photographs of found objects to use as our writing prompts. We’ll need 29 of them — it’s leap year. Every Friday throughout February, I will post a week’s worth of found objects. No context will be shared until the poems are posted. You are invited to write in response to the object (see suggested writing prompts below). I’ll post our poems and other written responses every day in February, or at least several times a week. Whoever shares the most poems this month will win a prize! IMPORTANT NOTE FOR PROJECT NEWBIES: The point of this exercise is to practice the habit of writing regularly, even if it’s just for one month. I post the responses as they are sent in so that we can focus on generating ideas, rather than on polishing for publication. I’ll post more instructions at the end of January. For now, send in those found objects! How do you respond in writing to a found object? As a poet and editor, I often see poems that begin with a visual image. Let’s stretch and use our five senses as a point of entry this time. What does the object look, smell, sound, feel, and taste like to you? Try using a non-visual image in your poem’s first line. What is the object’s backstory? Build a setting: Where might this object be found? Write a persona poem in the voice of the object. Prose writers, you are welcome to join us. Use the found objects to create a 100-250 word writing sprint. Are you working on a novel? How would your protagonist react to finding this object? Is it me, or were the Cracker Jack prizes better when we were kids?